I’m going with Toong, my amazing friend Tam and one of her friends. The pre-sale today was crazy. Every pre-teen in Victoria must be going, as the website kept crashing and all the floor seats sold out in ten minutes and it was hectic. 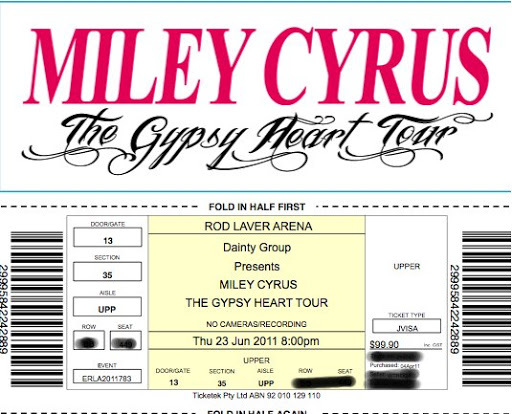 Our seats aren’t the best in the arena, but they’ll be fine and I mean, come on, it’s Miley freaking Cyrus! The only thing I’m kind of annoyed about is all the little kids will go with their parents expecting Hannah Montana and then she’ll be Miley The Skank and they’ll get all angry because it’s not appropriate and yet they’re sitting in the best seats in the house. Frustrating. I'M SO PUMPED! :DThat is so gonna happen, our family friend is planning to take her 6 year old daughter and my mum was like "You do know she won't be doing anything Hannah Montana?" and she was like "Oh I'm sure it's for kids." Yeahh, no.. pretty sure it would at least say Hannah Montana if it were true haha. I got my tickets! So glad she's coming to Perth!